Pinterest has struck again! I know that it's easy to get sucked into browsing and repinning -- only to realize an hour has gone by. However, tonight I redeemed some of that time. I actually put one of the pins into practice. Tonight was a rough dinner night. My plans to roast a lovely pork tenderloin in the oven fell apart when I realized that my intention to clean the oven earlier in the day was never fulfilled. I had an oven full of sprayed on oven cleaner and no amount of scrubbing and wiping down could make it stop smelling like chemical. Opting not to subject my family to chemi-loin, I went to my clutch dinner option -- pancakes! While I was whipping up a batch of from scratch pancake batter (courtesy of my friend, Deborah), I realized -- "hey, since I'm taking the time to make this stuff from scratch, I should utilize the time and make a DOUBLE batch for breakfast this week." 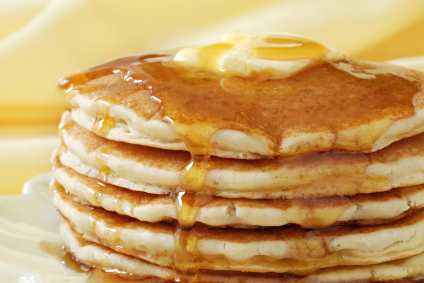 Simply make your pancake batter (and this homemade recipe is wonderful!) and store the excess in a cleaned out ketchup, relish, syrup bottle that has a squeeze top. And yes, I see the comedy of using a used syrup bottle, but I think it brings it around full circle. So, tomorrow (or the next day), I'll pull this handy guy out and easily squeeze out perfect portions of yummy batter for quick and easy pancakes. Really...I don't even think Eggo Waffles could be faster or easier. - Combine all dry ingredients well. In another bowl, mix wet ingredients. Add dry to wet ingredients and wisk until smooth. Makes about 16 pancakes. 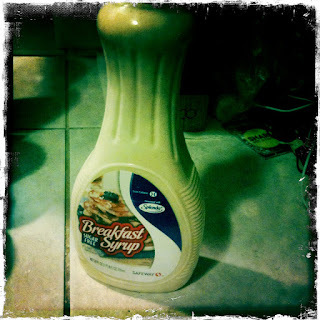 *If you don't have buttermilk, you can use this substitution method. This is per 1 cup (for this recipe, you'll have to double it). In a large glass measuring container, add 1 tbsp of vinegar. Fill with milk until you hit the 1 cup mark. Stir and set aside for at least 10-15 minutes. And now...enjoy! Your family will thank you!